The Welsh flag, a red dragon on a white and green background, is displayed prominently and a festive mood prevails. St David plays a very important role in Welsh culture but little is known about his life. It is believed that he lived to be 100 years old and that he died in 589, but the first texts on his life only appeared around five hundred years after his death. This means that it is difficult to tell which aspects of the St David’s story are true and which are legend. The Welsh flag, which features a red dragon on a white and green background, is often seen around the date of St David’s Day. 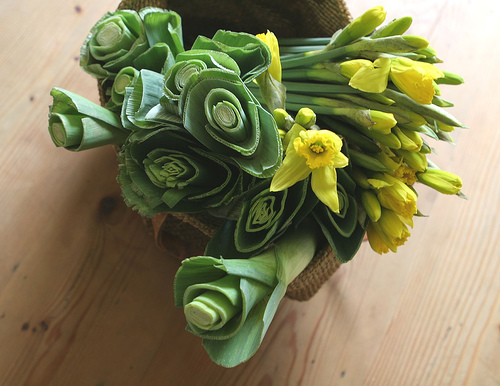 Many people also pin a daffodil or a leek to their clothes as symbols of Wales. On the day, people wear either a daffodil or leek, two national emblems of Wales. The leek is associated with St. David as it was seen as healthy, virtuous, with healing qualities. It also acquired mystic virtues with claims that girls who slept with a leek under their pillow on St David’s Day would see their future husband in their dreams! This entry was posted in England and tagged culture, flag, Wales, Welsh by Susanna. Bookmark the permalink.